RANCHO SANTA FE — The staff members at Helen Woodward Animal Center are experts when it comes to the constant influx of orphan dogs and cats arriving daily from shelters throughout Southern California, Utah and Arizona. But on July 7, a new arrival had staff members scratching their heads. 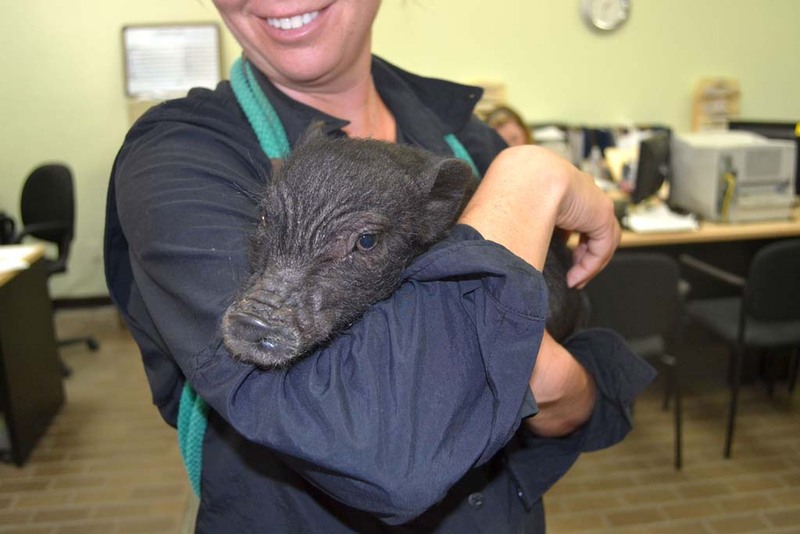 A Vietnamese Pot-Bellied Pig named Sherlock Hams stumped staffers when the “dog and cat only” adoption facility learned of his pitiful piggy “tail.” The center wants this pint-sized porker will help educate the community about the perils of making uneducated purchasing decisions and how these purchases lead to the overcrowded companion pet shelter situation every day. Sherlock Hams was a Del Mar Fair “Swifty Swine Race” participant. The San Diego resident who purchased him hoped to give her daughter a teacup pig as a present. By morning, however, the woman who had purchased Sherlock was completely congested and itching, as she discovered that she was allergic to the new resident. She had never owned a cat or dog because of her problem with allergies but had believed the hypoallergenic myth of this newest fad in pets. The “Teacup Pig” (also sold as “micro pigs” or “pocket pigs”) has a sweet temperament, surprising cleanliness and renowned intellect. However, “teacup” in comparison to their farm-bred brothers, they can reach weights of 120 to 150 pounds. Additionally, despite being referred to as hypoallergenic, pigs do produce dander and can cause the same sort of allergic reactions as other household pets. In the end, Sherlock Hams stole the heart of the center’s AniMeals Supervisor Erin Odermatt, who has agreed to take him as her own. “This is why Humane Education is so important to us,” said Education Manager Heather Disher. “Helen Woodward founded the Center by starting with adoption and education. Helen Woodward Animal Center is a “dog and cat only” adoption facility. For information on local pig rescue, go to grazinpigacres.org.